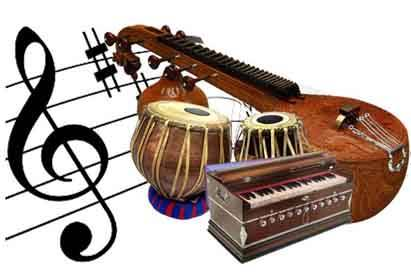 Hindustani music: One of the oldest music system that originated in Northern part of India. It is an Indian classical music that was present during 13th and 14th century. If Carnatic music is classical music tradition of southern part of India Hindustani is the classical music tradition of Northern part of India. The above two music are the base for Indian classical music. Hindustani music is based on raga while the Carnatic music is based on composition. The primary aim of Hindustani music is vocal performance along with Sitar or Sarod. The melodic scale is known as raga. Ragas are classified based on the notes used and based on Thaats (seven different pitches called as swara). The basic seven notes are Sa Re Ga Ma Pa Dha Ni. The performance is based on melodically on the ragas and rhythmically on talas in Hindustani music. There are many tals like Ek Tal, Jhap tal, Teen tal and so on. A typical raga in Hindustani music includes two stages. Alap and Bandish. Alap is the rhythmically improvisation of the rules of rag and Bandish is performed using tabla and is fixed melodic composition. There are different ways like staayi, antara, Sanchaari, Aabhog. There are three different variations in Bandish Vilambhit Bandish, Madhalaya Bandish, Drut Bandish. Hindustani music is formed basically for vocal performance. The musical instruments used in Veena, Sarod, Sarangi and violin. The major vocal forms that are associated with Hindustani music are Dhrupad, Khayal, Ghazal, Thumri, tarana and thappa. Dhrupad is very old form and is usually sung by male singers. The singers perform with musical instruments like tambura or pakhwaj. The lyrics are often sung in Bhrajbhasha (a language spoken in East India). The content and theme is usually in praise of some particular deity. Some of the prominent singers who sing in Dhrupad style are Nasir Moinuddin and many more. Khayal is more of modern Hindustani singing style. Khayal means imagination. Khayal sets two to eight line lyrics as melody and the singer uses these lines for improvisation accompanied by harmonium or sitar. A khayal song is called as Bhandish. The compositions cover various topics like romanticism, praise for Lord, Seasons, Dawn and Dusk. Some famous Khayal singers are Bhimsen Joshi, Amir Khan, Rashid Khan and many more. Ghazal is an important form in Hindustani music. It is written in Urdu. Ghazal exists in different forms like poetry, folk, pop. Some prominent ghazal singers are Jagjit singh, Pankaj Udhas. Ghazals are very melodic to listen and has good meaning and message. Thumri: The origin of thumri is still not clear as there is no historical evidence until 15th century. The text of thumri is usually romantic sung usually on Lord Krishna and his gopikas. Some singers of thumri are Noor Jahan, Gauhar Jan and many more. Tarana are usually performed at the end of the concert to convey the mood of joy. It is rendered at medium to fast pace and was invented by Amir Khusrao. Tarana was also used by the tenth Sikh Guru Gobind Singh in his compositions. Thappa is very catchy kind because of its bounce and re bounce of its notes. It started as folk songs of camel riders in Punjab however it became popular only in late 19th century and early 20th century. Its tune is melodious and sweet and depicts sudden outburst of love. Some prominent singers are Balashaheb poonchwale, Shruti Gokale and many more.